Garmin dezl 760LMT-D sat nav has been designed for use in trucks, HGVs and large vehicles. Equipped with voice activation and a large 7-inch touchscreen display, the dezl 760LMT features lifetime traffic and maps. The dezl 760LMT-D can be programmed with the dimensions of your truck and avoid unsuitable routes. Plus if you multi-drop, the 760LMT-D can navigate up to 15 multiple destinations. 760LMT-D also provides enhanced features making navigation easier than ever before including: Multiple truck profiles, Multi-destination, PhotoReal Junction View and Lane Assist. Garmin dezl 760 accessories including a 7-inch carry case are available to buy here. Garmin dezl 760LMT-D is a premium voice activated truck sat nav designed for drivers of trucks, lorries, oversized vans and other large vehicles. As well as trucks it also has other vehicle modes - making the dezl 760LMT-D a perfect partner for caravanners, motorhoming and even car drivers too. *NOH - A newly overhauled (NOH) device is a device that was returned to Garmin to be factory refurbished. To read more click here or scroll to the base of this page. The more expensive dezl 760LMT-D listed below the NOH model above is brand new stock, hence the saving with the dezl 760LMT-D NOH model. They both include and do exactly the same and have a 1 year warranty. The Bluetooth enabled dezl 760LMT-D includes lifetime European maps for both Eastern and Western Europe which are display on the units large 7-inch touchscreen. Mapping updates are free for the life of the product - this ensures you always have the latest street-level road maps for your journey. The Garmin dezl 760LMT-D enables you to enter your lorry's dimensions (height, width, length) into the 760LMT-D sat nav, routes are then calculated depending upon how narrow roads are, road height restrictions, etc. Multiple truck profiles can be saved making it the perfect partner for use in different vehicles and varying loads hauled. What's more the dezl 760LMT-D supports multi-destination calculation meaning you can enter multiple destinations and the dezl will calculate the shortest, most economical route. Garmin dezl 760LMT-D includes PhotoReal Junction View which will show photos of junctions and signs in advance of each junction to help guide you better than would be possible without the sat nav. Furthermore it features Lane Assist which is designed to alert you as to the lane you should be in at each junction in advance. There is also the ability to find the nearest petrol station, truck stops, supermarkets and service areas. The dezl 760LMT-D truck satnav features free real-time lifetime traffic information providing up-to-the-mintue traffic data for the road ahead. What's more the 760-D model utilises the latest technology using the DAB network (Digital Audio Broadcast network), this new network helps provide a faster, more accurate service. The Garmin dezl 760LMT-D, like all Garmin sat nav's, gets its speed camera data from the Cyclops speed camera database. The database provides advanced alerts to fixed, average speed, mobile, variable, temporary roadwork, red light and red light speed cameras. As you approach a camera, your device sounds an alert. Subscription charges apply. Click here to read more about the Cyclops speed trap database. Do you have a question about the Garmin dezl 760 that's not been answered on this webpage? Please see our sat nav FAQs for questions from other customers and visitors. Plus if the answer to your question isn't featured, use the online form to ask us for the answer. Alternatively please telephone 01733 777623 Monday to Friday (9:30am-5:00pm) to speak to one of our sales team. Garmin dezl 760LMT-D is powered via the supplied 12/24 volt vehicle power cable, the unit is then mounted on the windscreen via the supplied suction cup mount. We do not recommend using a third party charger with this product. A mobile phone USB charger or a laptop may not be powerful enough to reliably charge the Garmin dezl 760LMT-D and may provide an incorrect voltage or insufficient power. An official genuine Garmin AC charger is available for indoor use with this product you can view and buy here. Garmin dezl 760LMT-D comes preloaded with detailed City Navigator street maps for Europe provided from map supplier here. Rolling screen transition, accelerated map redraw and routing capabilities make screen zooming even smoother and ensure the navigation always matches your pace. If you'd like to buy additonal maps for another region e.g. North America or Australia and New Zealand. These can be viewed and purchased via the dezl 760LMT map page. Looking for accessories and spares for the Garmin dezl 760? 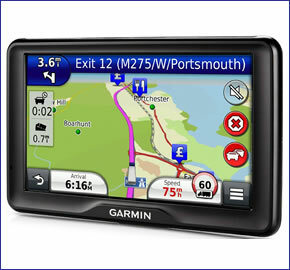 All parts are genuine Garmin product and specifically designed for use with the 7-inch dezl 760 truck sat nav. Looking for sat nav maps for the Garmin dezl 760LMT-D? All mapping comes on microSD card with SD card adaptor and is a genuine Garmin product. Areas available to buy include: Southern Africa and Middle East and Northern Africa. Question: I am interested in the garmin dezl 760 lmt-d, i am a truck driver and i just wanted to know are the new dezl 770 and dezl cam better than this one please. Answer: The Garmin dezl 760LMT-D is available as a Newly Overhauled product above. Alternatively, you can view the brand new 770LMT-D here. You can see the 770LMT-D within our comparison table here. Question: I have a Garmin dezl 760LMT but unfortunately the only traffic subscription it has is for North America. Can you advise how I can purchase the UK version? I have tried via Garmin but have been unsuccessful due to not living in the US. Answer: The North America Traffic subscription will be for the receiver block which forms part of the vehicle power cable. We don't get involved in separate Traffic Subscriptions but it should be a simple matter of paying from around £30 direct to Garmin to subscribe - using your existing cable. You will need to give them the serial number of the power cable. This cable is probably a GTM 36 or possibly the GTM 70. Garmin will then activate/authorise the receiver block in your cable to receive UK/Europe updates. Do you have a question about the Garmin dezl 760LMT-D? Submit your question via our contact page.